Do empaths have a harder time dealing with technology and EM radiation? How can empaths can deal with technology? 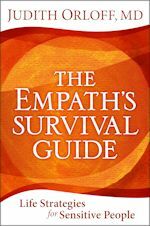 Answer: In The Empath’s Survival Guide I write about empaths, technology, and EM radiation. Some empaths are what I call “electro-sensitives.” They get exhausted or anxious around electromagnetic energy from computers, phone wires and cell phones so it’s important for them to take technology fasts. As an empath I don’t like talking on the phone—too much talking also gets to me-so I ask people to text me. But empaths can also feel the stress and other energy of people in texts too. So if you suspect the text is stressful shield yourself with a protection of light around your body. Research has shown that visualization is a healing mind/body technique. A practical form of protection many people use, including health care practitioners with difficult patients, involves visualizing an envelope of white light around your entire body. Or with extremely toxic people, visualize a fierce black jaguar patrolling and protecting your energy field to keep out intruders. Then breathe deeply and slowly go let go of any negativity you pick up. If all else fails and you absorb negative energy take a bath or shower.